On the northeast coast of Antigua, Blue Waters sits in 17 acres of manicured tropical garden, making it one of the most secluded resorts in the Caribbean. 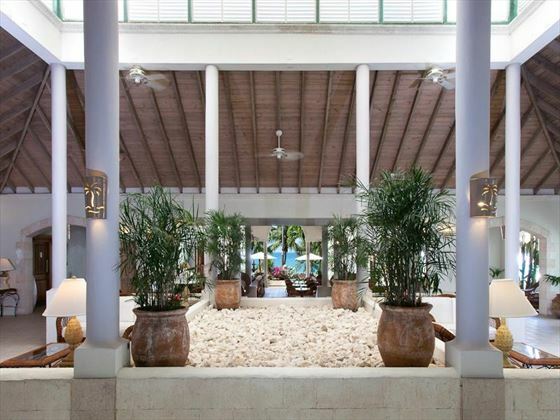 We love the stunning surrounds, flanked by two white sand beaches. This is an all-inclusive resort in elegant settings that is perfect for romantic couples holidays and relaxing family holidays. Blue Waters offers the intimacy and personal service of a family run hotel. We love the food here – there are three highly regarding restaurants offering a la carte dining in sophisticated style. And you can count on easy-going service with a warm smile – one of the hallmarks of Caribbean quality. It’s located just 15 minutes from the airport and 10 minutes from the capital St John’s, making it ideal for exploring Antigua and making the most of your Caribbean holiday. Top Tip: The beach has to be accessed by steps, so it’s not ideal if you have any walking difficulties or are travelling with anyone who does. 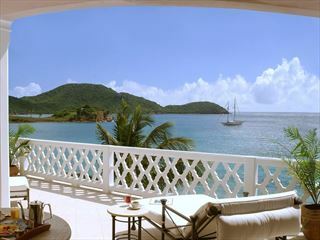 Further reading: Blue Waters is featured in our guide to our recommended family hotels in Antigua. 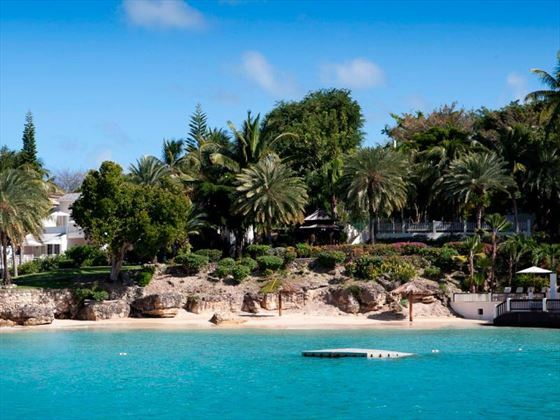 Located on the north-western corner of Antigua nestled along Soldier’s Bay, this beautiful resort is surrounded by intimate beach coves, tropical gardens and swaying palm trees – offering a tranquil ambience and a true insight into the Island lifestyle. The resort is only a 12 minute drive to St John’s, abundant with colourful shops and a beautiful cathedral, or you could even take a day trip to English Harbour - just a 45 minute drive away with the bustling Nelsons dockyard. 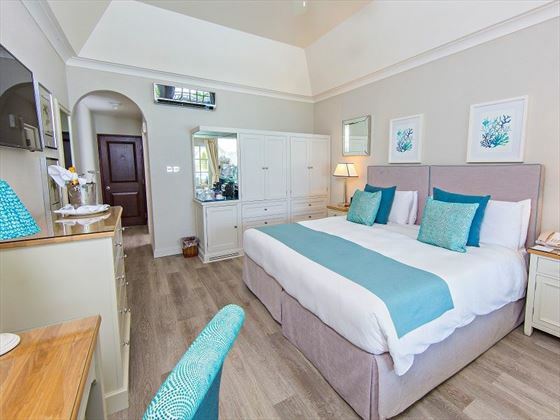 Superior Hillside – Nestled on the hillside, these elegant rooms feature a private patio or balcony overlooking the tropical gardens or sea, with standard amenities. Sleeps a maximum of two adults and one child aged between six and 11. 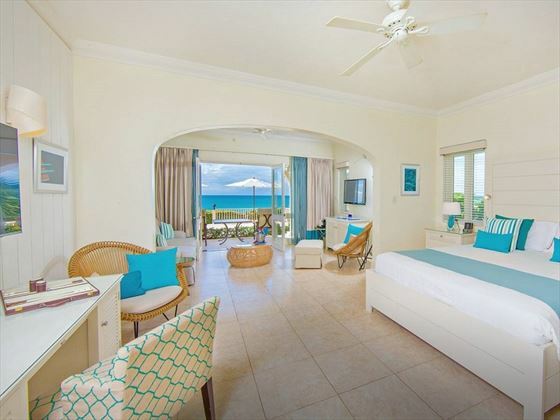 Deluxe Beachfront – These rooms offer modern Caribbean décor with gorgeous views of the ocean. Some interconnect, and all offer a private patio or balcony. Sleeps a maximum of two adults and one child. 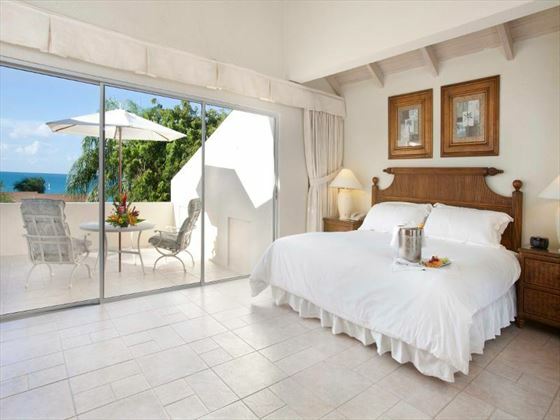 Hillside Junior Suite – Relaxing suites with partial sea views and lovely views of the gardens. These suites offer an open-plan living and bedroom area with an ensuite bathroom and double sofa bed. The option to interconnect with a Superior Hillside room is available. Sleeps a maximum of three adults, or two adults and two children. 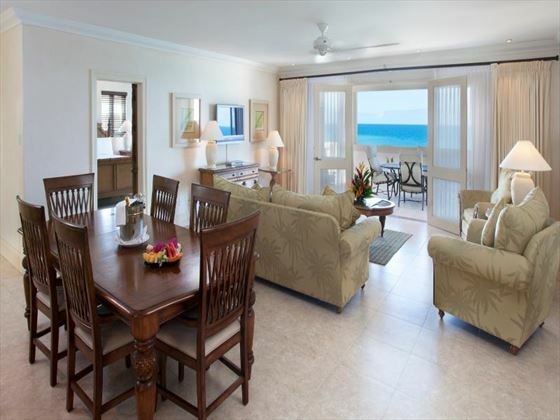 Beachfront Junior Suite – Spacious suites with a private balcony, a Jacuzzi, and scenic ocean views. Only yards away from the beach, watch the waves as you relax in the separate living area or bedroom. Sleeps a maximum of three adults, or two adults and two children. Luxury Suite – Sophisticated suites with the same amenities as the Beachfront Junior Suite, plus a private double balcony and more space. Sleeps a maximum of three adults, or two adults and two children. 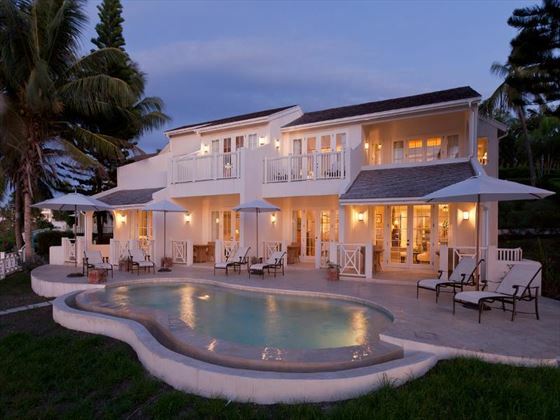 Pelican House – Luxurious 1,800sqft villas overlooking the sea from its private pool. 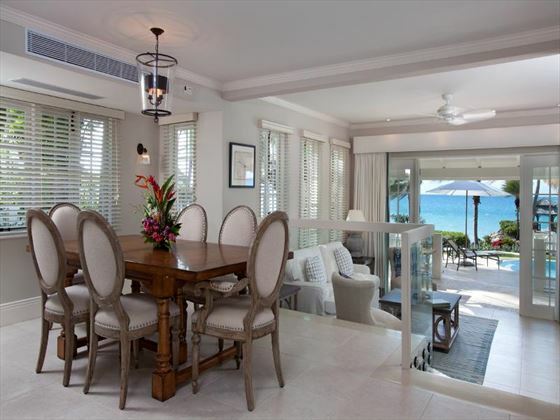 These villas feature a living area, kitchen, indoor and outdoor dining areas, and three bedrooms with ensuite bathrooms. Six bedrooms are available upon request. Sleeps a maximum of seven adults or six adults and four children when booking six bedrooms. 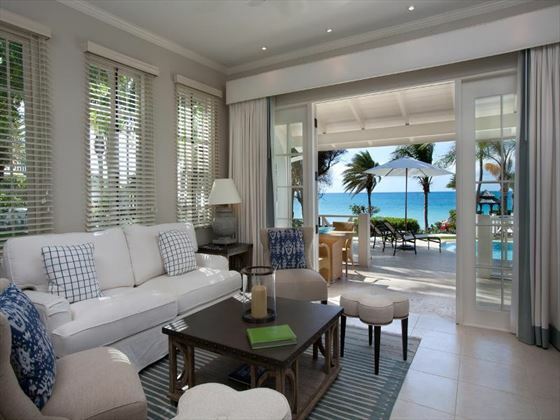 Rock Cottage – Intimate villas with unspoiled ocean views and a private terrace. These 1,200-2,000sqft villas feature a separate living area, kitchen, and a plunge pool. Guests can choose between two or five bedrooms. Two bedroom villas hold a maximum of four adults and two children, whilst the five bedroom villas hold a maximum of nine adults and three children. Turtle Cottage – Gorgeous 4,200sqft villas with classic interiors, offering a private kitchen, private pool, large sunbathing area, a patio and a balcony. Up to four bedrooms can be booked, sleeping a maximum of nine adults, or eight adults and six children. The Cove Suites – Incredibly decadent suites located away from the main resort - stay in a Cove Suite and you’ll be graced with true seclusion and serenity. These modern suites offer a spacious open-plan living area and bedroom, plus an ensuite bathroom. The suites are set along four blocks, each with their own pool reserved exclusively for Cove Suite guests. Sleeps a maximum of three adults, or two adults and two children. The Cove Penthouses – Nestled on top of the Cove Suites, these spectacular penthouses offer unparalleled 220 degree views of the ocean from their private balconies. The infinity pool reserved for guest’s exclusive use also overlook the ocean, and all penthouses feature a separate living area, a dining area, a kitchen, and three bedrooms. Sleeps a maximum of seven adults, or six adults and four children. Palm Restaurant – al fresco dining offering international cuisine and local specialities. Open 7am to 10.30am, 12.30pm to 2.30pm, 4pm to 5pm, and 6.30pm to 9.30pm (last order). Dress code: Casual attire, though always covered up during the day. 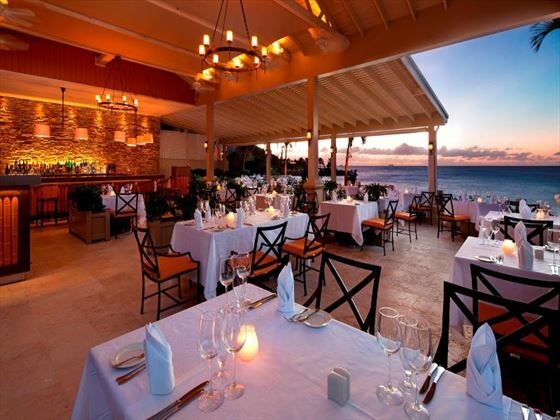 Bartleys Restaurant – an elegant, romantic restaurant serving delicious Caribbean cuisine. Open two to three nights a week depending on the season. Dress code: Tailored shorts or trousers and collared shirts. 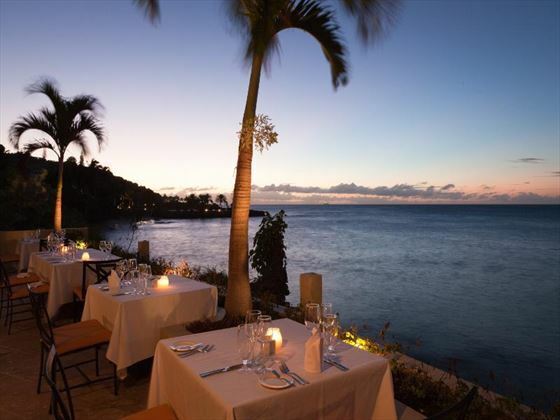 The Cove – sumptuous Caribbean cuisine with a French twist, located near the Cove Suites and nestled on a hilltop with beautiful sea views. Open 6pm to 9.30pm (last order), four to five nights a week depending on the season. Dress code: elegant evening attire, including collared shirts for men. Pelican Bar – an authentic, lively Caribbean bar, offering cocktails and a carefree ambience. Open daily from 6pm. Dress code: smart casual wear. Veronicas Bar – located by the main pool, sit by swaying palm trees and gorgeous pool views as you sip on your drink. Beach Bar – a rustic bar stocked with fantastic cocktails and comfortable sun loungers. There are nine fresh water swimming pools - including four exclusively for Cove Suite guests, an adult-only pool near Pelican House, family friendly pools by Veronica’s Bar, and a beachfront pool with fantastic views of the sea. 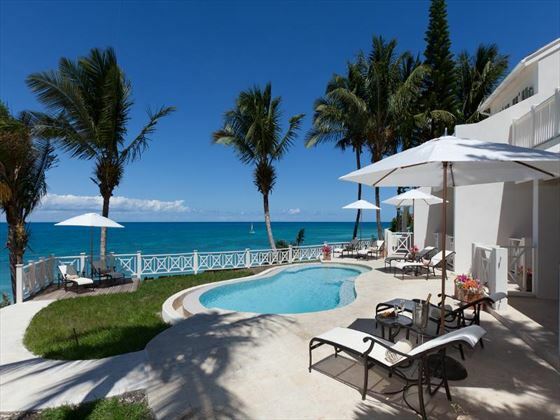 The resort is nestled along Soldier’s Bay, offering guests three secluded beaches. The Spa at Blue Waters – in collaboration with Elemis, the spa comprises of four spacious treatment rooms, offering the opportunity to rejuvenate your mind, body and soul. The Blue Waters Kids Club offers fun activities for 4 to 12 year olds – including arts and crafts, football, jewellery design and ice cream trips. There is also a “Secret Garden” where children can enjoy a range of exciting activities. Children will be provided with a free drink and snack during each session. Open 8.30am to 12.30pm, and 1.30pm to 4.30pm. The kids club is complimentary to guests, though you will need to pre-book. For children aged between fourteen and forty seven months, all children will be looked after under a strict ratio of 1 staff member to 3 children by lovely staff trained by the Worldwide Kids expert trainers. Open 8:30am-12:30pm and 1:30pm-4:30pm Monday to Saturday. It is closed on Sundays. Spend some quality time with your partner or to yourself on your break away in the assured knowledge that your child is in the best hands possible. Childcare staff and staff trained by Worldwide Kids will be on hand, and all babysitters will have carried out a police check before undertaking any babysitting. Babysitting is organized by the childcare coordinator in the resort. It can be pre-booked or booked whilst in the resort. Pre-booking is strongly recommended. Babysitting is charged to the guest’s room and will be payable at the end of their holiday. US$10.00 per hour per child (min 3hrs). US$15.00 per hour for 2+ children (min 3hrs). For service after 11pm, the rate is increased by US$5.00 per hour. There is a transportation cost of US$20.00 which will be added to the bill when booking the babysitter. Offer valid for an added cost of $260. This hotel has earned the title of "World’s Most Romantic Resort" 14 years in a row. Filled with the authentic charm of the island in its lush garden oasis known as the Caribbean Grove or modern style state-of-the-art Mediterranean Village. 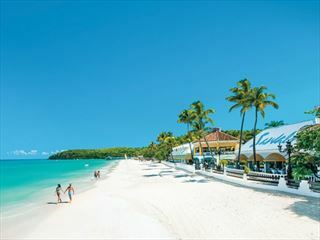 Located on Dickenson Bay.